Pro-Ject announces Phono Box S2 Ultra and Ultra 500 phono stages | What Hi-Fi? Pro-Ject Audio Systems has announced that it's shifted a massive half-a-million Phono Box phono stages. And to celebrate, it's introducing two new phono stages in the form of the Phono Box S2 Ultra and Phono Box Ultra 500. What's special about the S2 Ultra phono stage is that it manages to cram in advanced tech while keeping a relatively low price tag. As such this replaces the Phono Box DS and DS+. The £200 S2 Ultra uses a fully discrete electronic layout, polystyrene capacitors (usually reserved for pricier models) and ditches operational amps ('op amps') on the quest to achieve a 'warm and harmonious sound'. The unit itself is compact and features dip switches for impedance, capacitance and gain controls, making it ideal for turntables using MM or MC cartridges. 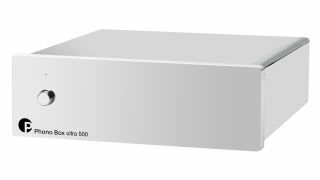 Also announced is a special edition £299 Phono Box Ultra 500, which is supplied in a wooden display box and limited to 500 pieces worldwide. It utilises the same technologies in the S2 tech, but has a chrome-finished copper chassis designed to protect it from high-frequency interference.